First things first, I have named my condo. From now on, when referring to my condo on this blog I will call her "dollhouse". I'm doing this so she doesn't get confused with my parents house, my old place, Blair's condo, or any future homes I might have whilst blogging on this blog. I hope to have this blog a very long time, so it makes sense to give each chapter of my home-owning life a name. Dollhouse is the perfect name for my current place because it is the first home that is all mine - my little dollhouse to decorate and live in as I see fit. Today has been a busy and very productive day in the dollhouse department; I finally decided on a coffee table, plus went to Ikea to purchase a few more key items that I have been coveting. In my Coffee Table Hullabaloo post, I asked for your opinion on which coffee table to get, as I was torn between a few great options. You all came to my rescue and voted for #4, the West Elm Box Frame Coffee Table, which to be honest, I was loving as well. It has clean, modern lines, but still has a shabby chic edge with its whitewashed top. I'm happy with my selection! I ordered it today, but it won't be delivered for about 2 weeks, so I will do an update post once it arrives. I also ordered the West Elm Parsons Desk in white - it's on sale right now and I have been lusting after it! A few accessories completed my West Elm purchase, which will all be featured in future posts. After spending way too long looking around on the West Elm website I decided to take a spur-of-the-moment trip to Ikea. I have been needing to go for awhile, but to be totally honest I have a very love/hate relationship with Ikea and I HATE going. I've been putting it off for over a month so I said to myself, "Self! Today is the day. Onwards!" and ended up checking out 5 hours later with way more stuff than was on my list (typical of Ikea trips). I got a ton of accessories, and I'm thinking about doing either a haul on here or a haul on EllesGlitterGossip, but I also ended up with some big items. I purchased 5 of the Henriksdal Bar stools in "Gobo White" for my kitchen counter, which I have been wanting for ages and featured in my last blog post. They are super comfortable, a bar stool "must" in my opinion, and the fabric cover is replaceable if they get dirty, which is fantastic. Plus, there is this website called Bemz that sells custom slipcovers for a bunch of Ikea pieces, including this model. So in the future if I decide to update the look of these chairs it will be super easy to do. That, and the fact that these were WAY less expensive than any other bar stool I found, sold me on them. Who knew bar stools were so expensive? I had pretty much decided on getting the CB2 Chill Media Console for my TV stand, and even featured it in my last post, but after making some more mood boards of my living room I changed my mind, and decided on the Hemnes White 3 Drawer TV Unit. I am going to replace the knobs to something more feminine; either plain crystal or solid gold. 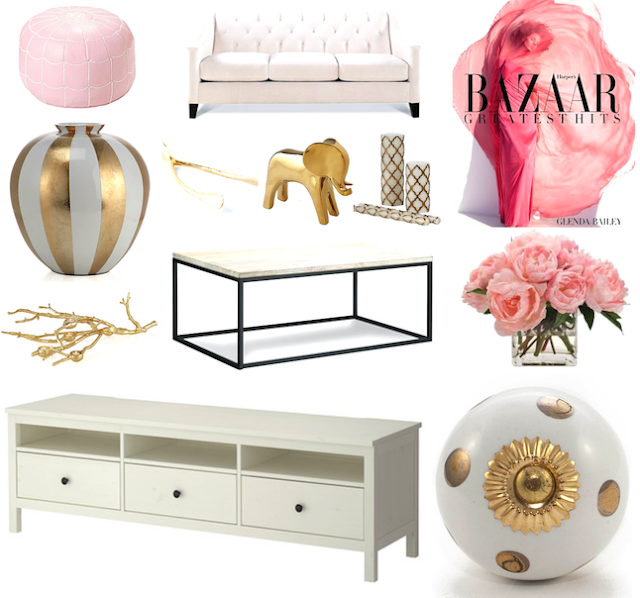 Here is the mood board I made featuring the new TV Unit; you can see my decor colors are cream, white, gold, and blush pink. I also plan on adding in more neutrals around the main area of my condo like gray, brown, and dark metals. I love the look of neutral living spaces. I love the way my condo is turning out! It's still at the very beginning stages of turning into a "home", but I think it's slowly coming together! Now I just need to sit down and tackle some clutter piles that I have never gotten around to since moving in. Very Cute! It's definitely you. Haha! Question: Have you gotten your closet system yet? I'm trying to get ideas on what to do with my closet in my new house. Elle, I am loving everything you have chosen and can't wait to see the final reveal! My decor style is very similar to yours, so I am borrowing some of your inspiration and incorporating it into my own home. :) By the way, "dollhouse" is such a cute name for your condo. Elle, Dollhouse is such a cute name! I'd love to see you do your patio next. I want to start decorating my balcony so it would be great to see what your ideas are as I'm a bit stuck for inspiration at the moment. Such great pieces for your dollhouse! When are you uploading your "Updated Condo Tour"? I am all eager to see it. I would love to see a haul on the things that you got from ikea!! Also, I am loving the way that you are designing your new little home!! And I am sure that you know this already but Pier 1 has some amazing home accessories too!! Eager to see the updated Condo Tour after everything is delivered! I have the bar stools as well, and love them! Would love to see entry way done next. We have the Hemnes 3 drawer unit in black and love it. Lots of surface area to put stuff on, and the drawers hide all the mess like video games and other odds and ends. 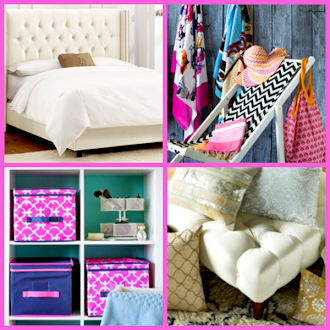 What do you use to create your mood boards? I think you should paint the bottom that coffee table (the black portion) gold or rose gold. I think it'd look really nice. I feel the same way about IKEA, I hate going because it's overwhelming and takes forever, but when I'm there it's like my husband almost has to put me on a leash! We just moved as well (with three children, I don't know what posessed us, lol!) it's tiring but a lot of fun! I love that you are calling your condo your dollhouse. Your decorating style is so cute! can't wait to see what the final product looks like!! I love the sub-edit DOLLHOUSE! It is so cute for a young woman and very you. I always refer to my home as Ivory Tower on my blog www.mariebruce.blogspot.co.uk - I think it helps to categorize posts and readers can see at the start what type of post it is going to be. Please do the haul as a video -I've been missing your Glitter Gossips and Glitteratures. I love the 3 drawer tv unit! I also have a giveaway running on my blog at the moment. :3 Just for anyone who is interested. I find that it's very difficult to design a home from scratch because of the amount of endless options there are available! I find the same problem when decorating my new room, but slowly and surely I think I'm going somewhere - the style is very similar to yours, Elle - a white, sleek look with girly, cosy touches! Your condo will look amazing! love the color cobion that you chose it reminds me of that's hearts room :) looking forward to your room tour vid elle! Also I love all the pieces you've been getting! Your dollhouse is going to turn out amazing! I'm obsessed with blush and gold. I'm getting the itch to redo my living space now! Let us know if the Hemnes TV stand seems "sturdy" to you. I've been toying with the idea of purchasing one of the Hemnes Dressers, but was concerned that it wouldn't be "solid". I can't believe you hate going to Ikea, well I know it's busy and there are a lot of people, but you can get so much inspiration and everything is so inexpensive! Love that you named your condo "Dollhouse"! That's so cute! How do you make a mood board? Can´t wait to see your dollhouse tour on youtube!!! Your decor related blogs & videos are becoming my favorites. I, too, am a fan of the neutral decor with loads of texture and pops of easily changeable color. I can't wait to see video updates of how things are coming together as you get new pieces, accessorize, hang artwork, etc. The process is so much more fun to me than just a quick, end-result flash. Please feel free to post many videos of this wonderful process of "Decorating the Dollhouse" (cute series name... nudge nudge wink wink). I would love it if you include your thought process behind the purchases and all the triumphs and challenges along the way. I look forward to the next video opportunity to "visit you" at your Dollhouse. Keep up the great work! HELP!I love you and i am in a desperate situation.My mom needs surgery or she is going to die!i am alone and my money has all been used in her care. i need $1500. This is NOT A JOKE! I NEED HELP!I am from Bangladesh. i am going CRAZY! HELP PLEASE! Please contact me on janesecrets1@gmail.com for details. I can PROVIDE EVIDENCE if needed. Please Help save my moms life!!! Elle, What kind of hardwood floors are in your condo? I love the style and colors.. Thanks for sharing your decorating with us. Lovely. We decorated in neutrals too.